Membership in the Wyoming State Bar: All of our attorneys are members of the Wyoming State Bar, first organized in 1915, which regulates the practice of law in the state, facilitates quality legal services for the public, and assists attorneys in the professional practice of law. Membership in The National Association of Criminal Defense Lawyers: This national organization’s mission is to "ensure justice and due process for persons accused of crime or other misconduct," and we are proud to be a part of it. 2014 Client Satisfaction Award from the American Institute of Family Law Attorneys: AIOFLA is an impartial third-party attorney rating organization, which conducts a rigorous selection process before honoring attorneys with awards. We think a "Client Satisfaction" award is the best one possible! 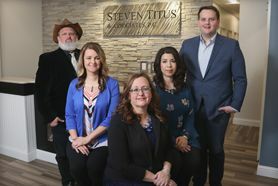 Former Wyoming Office of the State Public Defender: As a former public defender, Steven Titus knows the ins and outs of the criminal justice system in Wyoming. This office serves to provide Wyoming residents with competent, experienced counsel, and represents a vast majority of criminal defendants who need legal aid. Graduate of the National College of DUI Defense from Harvard Law School: This nonprofit educates attorneys on wide-ranging legal issues involved in DUI defense, including "search and seizure, due process, illegal interrogation, denial of counsel, pseudo-scientific areas such as field sobriety testing, and other evidentiary issues." Student Body President – Colorado State University-Pueblo: From 2009-2011, Steven Titus "served the fastest growing and most diverse student population in the State of Colorado for two terms." Presidential Award – Colorado State University-Pueblo: This scholarship is the highest offered by Colorado State University, Pueblo. In this case, it was awarded for leadership, campus and community involvement, and a 4.0 grade. Representative on the Colorado State University System’s Board of Governors: In addition, Steven Titus served as an official representive. The Board of Governors allocates nearly $1 billion a year to the Colorado State University System’s campuses. Membership in the Wyoming Trial Lawyers Association: Steven Titus is proud to be a part of WYTLA. This voluntary organization is dedicated to improving its members’ trial skills, networking, education, and access to resources to help their clients find justice. Call (307) 257-7800 to discuss your case during a free consultation.